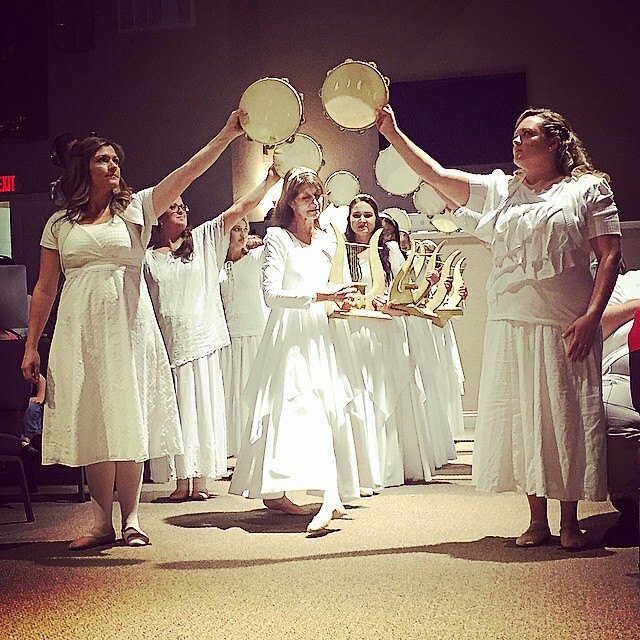 The Tabernacles of Praise Dance Ministry, located in Brandon, Florida, is under the leadership and vision of Beit Tehila Congregation. Founded on the Hebrew roots of the Christian faith by Pastor Tikvah (Dryer) Kolbo. Pastor Tikvah’s vision was to incorporate the arts, including dance, to worship God as well as to effectively teach the Word of God. The Hebraic/interpretive dance group is now under the leadership of Joanne Cecere. Joanne is a dancer, choreographer and an instructor. She has ministered in dance at churches and Christian conferences throughout the United States as well as in central America, Europe, Russia and in Israel as part of the Christian Embassy’s Feast of Tabernacles in Jerusalem. She began dancing and choreographing for Beit Tehila’s annual Restoration of the Tabernacle of David Conference in 2001. Joanne states, “My favorite dances are the worship pieces. Through these dances we get to express our love for the Lord. Pastor Tikvah set a solid foundation for this ministry and nurtured it to the maturity it has today. My vision for Tabernacles Praise is that we would grow in our dance as well as in our expression of love for God and that we would effectually convey His love each time we dance.” Tabernacles of Praise ministers at Beit Tehila each feast day and at conferences and churches by invitation. Tabernacles of Praise has produced two videos. “Praise Him with Dancing” and “Dancing Through the Feasts” (in Israel). If you are interested in the videos or in having Tabernacles of Praise minister at your congregation or event please contact Beit Tehila at (813) 654-2222 or info@topraise.net.